« Dream Big: Engineering Our World – Informational and Inspiring! An emotional masterpiece, Big Fish & Begonia is an artistically magical and thought provoking piece of anime. The animation is beautiful. I felt as if I was watching a classic painting come to life. The story is unforgettable. Each scene left my heart yearning for the characters to succeed. The story follows a humble, brave girl name Chun who dedicates her life to help a kind boy, Kun, who gives his life to save hers after she travels from her magical to his human world. She goes to great lengths to bring him back and gives him all her love and care. However, when a variety of obstacles threaten Kun’s survival, Chun risks everything to save him. The an imation is mystical and brings Chun’s fantastical land to life. The characters from Chun’s world are unique and their strange characteristics bring a special quality that is unlike other films. Many characters have a quirky addition such as antlers or a completely other-worldly face with multiple eyes. These subtle additions enhance the fresh and original elements the film specializes in. The backgrounds and scenery take the animation to the next level. The water and ocean play a huge role in the film and the animation transforms the water, displaying its beauty and importance. At night the ocean reflects the sky, its stars and the sublime hues present; while during the day it is almost invisible and many objects look like they are floating through air. One of the most notable animation feats is the scenery. In many favorite parts we see Chun running across landscapes and the camera captures her world in the most artistic way. The emotions of this film left me in awe, showing the friendship and love these characters are capab le of. In every scene, I was either smiling or in tears because of the sacrifices they make for each other and for each others’ happiness. The music enhances the mood of these scenes with a mysterious and peaceful quality. The messages of Big Fish and Begonia are: 1. If your conscience is clear, it doesn’t matter what others think and 2. Follow your heart. I give this film 5 out of 5 stars and recommend it for ages 14 to 18. 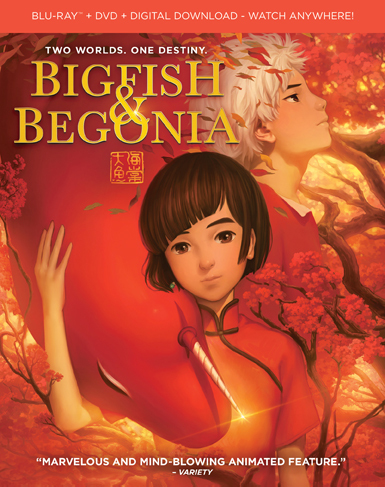 Check out Big Fish and Begonia on DVD August 7, 2018. This entry was posted on Friday, July 20th, 2018 at 2:59 pm and is filed under DVDs Released. You can follow any responses to this entry through the RSS 2.0 feed. Both comments and pings are currently closed.